April’s frontline festival is on one of my favorite topics: Employee Engagement. We have a wonderful line-up of posts. We begin with this month’s graphic from Joy and Tom Guthrie of Vizwerx LLC (see below). Jesse Lyn Stoner, of the Seapoint Center, offers her guest post on switch and shift, First Engage Yourself. It’s difficult to engage your employees if you yourself are not engaged. Here are 7 questions to assess your own engagement and suggestions for what you can do. Follow Jesse @JesseLynStoner. Wally Bock, of Wally Bock’s Three Star Leadership, shares 10 Engagement Building Behaviors For The Boss. Study after study has shown us that if you’re the boss, you are the person with the biggest impact on the productivity, morale and engagement of your team. Here are ten things you can do to improve all three. Follow Wally @WallyBock. Tune it to Tanveer Naseer Leadership to find out what 3 critical steps leaders should be employing to boost employee engagement levels in their organization. Read Tanveer Naseer‘s post Learning To Connect To Boost Employee Engagement. Follow Tanveer @TanveerNaseer. Alli Polin, Break the Frame, brings us practical advice in her post Are You A Negativity Carrier Or The Antidote?. There will always be negative people at work who like to create a crisis. Discover how you can transform their negativity and invite engagement. Follow Alli @AlliPolin. Mary Jo Asmus, ofAspire-CS.com, offers Where Do you Spend Your Time?. A recipe for failure in a new position: keeping your head down, not reaching out to others. This post offers tips to lead and actually lead your team to get them engaged. Follow Mary Jo @mjasmus. Jim Ryan, Soft Skills For Hard Jobs, shares Morning Check-In Meetings – Maybe The Most Powerful Management Tool There Is. Making a simple addition of a quick 10-minute meeting before the day starts can have quite an impact on the engagement level of your team. I’m with Jim, I had certain roles where a morning check made all the difference. Follow Jim @jryan4. In her post, Please, Thank You, and I’m Sorry – Words For Kindergarten & Leadership, Robyn McLeod from The Thoughtful Leaders Blog shares how these three phrases that we learned in kindergarten can pave the way for better relationships and communication at work as well as engender trust, respect, and a higher level of engagement from your staff. Follow Robyn @ThoughtfulLdrs. Matt McWilliams, author of Life. Leadership. Love. Learned the Hard Way, offers Two Scientifically Proven Techniques To Be A Better Leader, Spouse & More. In this post, he shares two incredible techniques that will increase employee engagement and so much more. Follow Matt @MattMcWilliams2. Chantal Bechervaise, Take it Personel-ly shares specific ways to offer support in her post, Help Employees To Believe In Themselves. Employees need to know that you have faith in their ability to do their jobs well. It also requires commitment to help support employees when times are tough. Follow Chantal @CBechervaise. Julie Winkle Giulioni, of juliewinklegiulioni.com shares a sentiment I often feel. It’s not always about doing more to drive engagement, but by what we need to stop. In her post, Stop Driving Employees Nuts, Julie reminds us that employee engagement, motivation, and results are less about introducing new leadership behaviors and more about just stopping the stuff that makes employees crazy. Follow Julie @juliewg. How important is heart to mental toughness? LaRae Quy, author of Empower The Leader In You, shares 5 Unconventional Ways You Can Lead From Your Heart. Mental toughness is finding a way to continue moving toward our goals, even in tough times. But if our heart is not the driving force behind those goals, failure will be enough to persuade us to give up and try something else. Follow LaRae @LaRaeQuy. Martin Webster, of Leadership Thoughts, brings us 4 Reasons Your Team Is Frustrated With Your Leadership. Do you know if your team is frustrated with your leadership? Learn about some common team gripes and what you need to do about them. Follow Martin @tristanwember. Chip Bell, of ChipBell.com, brings us The Leadership Echo. Leadership is an echo sounded through the actions of those under the leader’s influence. Customers get a peep-hole into the organization’s culture their experience created and delivered by the front line. Follow Chip @ChipRBell. Steve Broe, of My Career Impact, shares Why Do We Need To Assess People to Build A Great Organization. Take the time to evaluate people working for you. Consider their strengths, look at how their strengths can best be deployed. Follow Steve @DrSteveBroe. What are you engaging employees to do? Kate Nasser, of Smart SenseAbilities offers Engaging Employees to Succeed At What – Integrity. When leaders approach me to help them with employee engagement, I immediately ask them: “engage employees to do what?” If you want company-wide success, engage them to engage each other. This is how to build accountability and integrity throughout the company. Follow Kate @KateNasser. 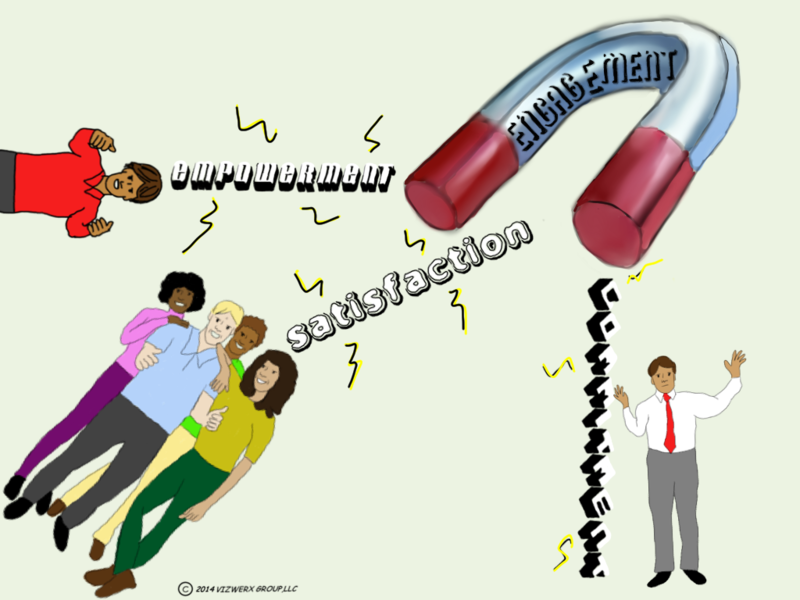 Jennifer Miller, of The People Equation, shares the7 Moods Of Employee Engagement. Leaders need to learn to coax the troublesome types out of their moods in order to create the most productive and engaged work environment. Follow Jennifer @JenniferVMiller. Michelle Pallas, at Fireside Chat For Leaders, shares a post on a life strategy I believe in deeply. Care Enough To Take The Time To Know People. Go first, get engaged. Show you care, make connections. It doesn’t cost anything to care. It requires energy and focus. Listening with heart and mind. Engage your workforce by taking the time to know them. Follow Michelle @MichellePallas. Chery Gegelman, of the Simply Understanding Blog offers, Banging Pans & Throwing Fish In Corporate America. An under-performing, under-supported team that was feeling victimized, changed leadership, changed their focus, learned how to play together, built trust, began meeting and then exceeding their goals and a VIP customer said, “I don’t know what you’ve done with the place, it was a tomb, and now it is alive.” Follow Chery @GianaConsulting. A powerful personal story that shows the impact we can make, when we invest in one person at a time. David Dye, of Trailblaze, shares The Leadership Question I Couldn’t Answer. How do you motivate a former gang member to succeed in school? David shares his surprising answer to that question and how it will help you lead motivated, energized teams. Follow David @davidmdye. Brett Faris, of Feed Leaders, shares How To Be Great With People. This is a fun, short post on 3 lessons his golden retriever taught him on how to be great with people. Brett writes with the church leader in mind however believe it is applicable to all business owners. Nothing like taking lessons from a dog. Follow Brett @BrettFaris. In this case study, Overwhelmed, Linda Fisher Thornton, of Leading In Context explains how a a caring manager is one of the key elements that drives employee engagement. So managers, let’s remove “It’s all important. I’m sure you’ll figure it out” from our vocabularies. DATIS Delivers, Thought Leadership For Human Services Organizations, shares Employee Engagement: A Time To Give. Does your company have an employee engagement program? Empower your employees by using technology as a tool for success while building a foundation for solid communication in your organization. Follw Datis @DATISe3. Artika Tyner, Planting People, Growing Justice shares Jumpstart Your Career: 3 Tips To Discover Your Strengths. Employee engagement can be fostered by supporting strengths development and developing the leadership capacities of your team members. This blog provides 3 key tips for strengths development. Follow Artika @DrArtikaTyner. Michelle Cubas, of Business Influences, brings us Employee Engagement Is About Purpose. Why do people want to work—employee engagement is about purposeful action. Follow Michelle @CoachCubas. Subha Balagopal, From the Principal’s Pen offers For An Organization With People. This post is about how I engage with my organization and how I think employees might engage in a healthy organization that invites their voices. Follow Subha @PrincipalsPen2. May’s Festival is all about Careers and Career Development. Please submit your posts using this link. New participants welcome. Posted in Employee Engagement & Energy, Frontline Festival and tagged advice for frontline leaders, corporate culture, employee engagement, frontline festi. Collective Changes is looking for mentors – we have 5,000 women in South Africa beginning in August that are looking to grow their business skills and grow jobs. We need mentors to help them and hold them accountable to their tasks. One hour a month virtual guidance and in return – we will provide you the GLEAN ™ Leadership Skills Training and certification. We cover assessments, global mindset, leadership quotient, ethics, agility thinking & focus and negotiation and communication techniques in a virtual world We hope you can pass this around and send to anyone who would like to grow into their role in the leadership pipeline. If your interested go to http://www.collectivechanges.net and sign up as a mentor. We are a 501 c3 nonprofit working with the Universal Postal Union, International Technology Union, South Africa, Concero Connect and Chronus Mentoring Software. Karin – Thanks for hosting! I know this takes a ton of work!